tammy's blog: Steps towards a greener life. Steps towards a greener life. It's been ages since I've blogged. That's not because I haven't had anything worthwhile to share, but like anything else blogging requires some level of commitment, and I must say I've been slacking. But, it's time to breath some life back into this baby, so I'm back at it! Hopefully I will stay more focused and more balanced so that I can share some helpful tips and ideas with others. In the past year or so since I've shared with you, I have made some small but significant improvements in my life that are helping me and my family to leave a smaller carbon footprint on this planet. Most of our lives has been spent making trash, using up natural resources, consuming, wasting, depleting.....you get my drift. It's time to start being responsible and instead of only "taking" we need to start conserving and contributing for the sake of future generations. Here are a few simple steps that we have implemented in our home to help reduce the use of energy, waste and pollution. Perhaps some of them will inspire you to do the same. 1. 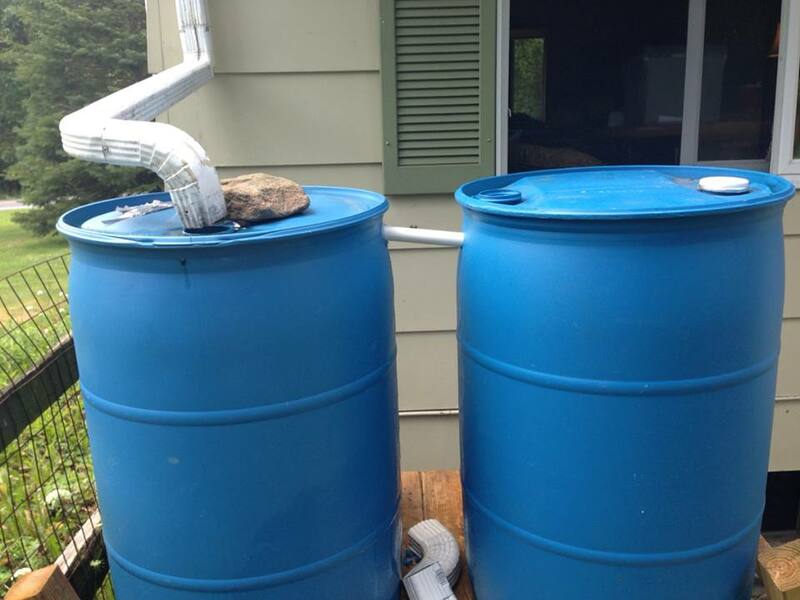 We installed rain barrels. We've been wanting to do this for years, but finally got around to it this spring. It took about 90 minutes during a gentle rain for the first barrel to fill up. So we decided to add an overflow barrel. It's raining out right now, and both barrels are completely full. Since we use well water, this can really come in handy during times of drought. We simply bought a 55 gallon barrel (recycled) for about $15 and built a small stand to set it on. Then we put a spigot on the bottom of the barrel and ran the downspout into the opening at the top. Then we put a small piece of PVC at the top of the first barrel and attached it to an identical second barrel. It was so easy and inexpensive! That's 110 gallons of water that will no longer be sitting on our lawn creating a swamp each time it rains. 2. Clothes lines. We are fortunate enough to live where nobody can see our backyard, so I don't have to worry about what the neighbors will think when I hang my laundry out to dry. I'd say I use the clothes line about 95 per cent of the time in the spring and summer months and maybe half the time in the fall and winter months. When the sun is shining, I start washing clothes so I can hang them out to dry. This is a great advantage that comes with working from home. The wind actually irons my clothes as they dry - which rocks because I hate ironing! Plus everything smells so fresh and clean after hanging out on the line to dry. Imagine how much we save in electricity by not using our dryer! 3. No More laundry detergent or fabric softener. I recently discovered these amazing things called soap nuts, which are not actually nuts but berries that grow on trees in the Himalayas. They have a coating on them called saponin which creates a soapy effect in water. Soap nuts are organic and 100% biodegradable. They have been used for centuries in other countries for laundry, bathing, shampoo - all sorts of things. I used to make laundry detergent from my soap, but now I use soap nuts instead. If you are interested in getting soap nuts for yourself, let me know, I like them so much I added them to the products I sell. Soap nuts really work too! They soften the fabric and lift the fibers so the dirt comes out. You will swear my towels were rinsed in fabric softener because they are so soft. And talk about inexpensive! It's the cheapest thing you can use for laundry. Even cheaper than homemade laundry detergent. No more harsh chemicals are going into the ground every time I wash clothes. 4. Recycle. Recycle. Recycle. We throw away very little trash in this household. In our garage are 3 containers for recycle materials - glass, plastic, and aluminum. It's really quite easy to recycle once you get into the habit, and you will not believe the amount of waste you can save from landfills by recycling! 5. Compost. Compost. Compost. All non-meat and non-dairy food waste that cannot be fed to the chickens goes into the compost bin. That compost bin will yield black gold in time - a rich, sweet soil that will go on the garden to feed our plants. All chicken manure goes into a big compost pile (along with the wood chips we use as chicken litter). This has to cure before it goes on the garden, but when it does it makes a fantastic source of nitrogen. Our garden is producing noticeably larger veggies with the addition of chicken manure. Each time we burn paper or cardboard trash we use the ashes as compost on our garden. Ashes are also an excellent soil amendment. All of the leaves we rake up, limbs that fall from trees, weeds we pull from the garden, grass clippings we rake up, etc. go into the compost pile or the compost bin. Composting takes time, but once you start using this wonderful stuff on your garden you'll start looking for more and more ways to create more compost. 6. Eliminate plastic bottles. I bought several reusable stainless steel bottles that I keep filled with water and store in the refrigerator. Whenever I head out I grab a bottle or two take with me, and I don't have to stop and buy water when I get thirsty. At the end of the day I wash them, refill them and put them back in the fridge. If everyone did this one simple thing, imagine all the bottles that would not have to be produced, shipped, recycled or end up in landfills. It's such a small thing, but it can make a huge difference over a lifetime. It saves a lot of money too! 7. Reduce the use of plastic bags/containers. I used to store all my staple goods in plastic bags or plastic containers to keep them fresh. Now I use canning jars. No more avalanche of falling tupperware when I open my cabinets. My cabinets are filled with all sizes and shapes of glass jars that keep things fresh and are easy to clean and reuse. I have to say, my cabinets actually look much better now. And leftover food from dinner goes into canning jars as well - soups, salads, veggies, etc. Just put them into a jar and pop them into the fridge. (Canning jars are easy to find at yard sales too). 8. Turn off everything. Not just the lights, but the television, radio, ceiling fans, etc. are often left on throughout the house even when nobody is in the room. These things slowly sap the electricity unnecessarily. It's not just about saving money on the electric bill, but conserving energy. Again I say, it's the simple things that add up and make a difference. 9. Reusable shopping bags. I know, I know, you're thinking "duh". But do you really do it? How many times do you remember AFTER you get in the store? I probably have a dozen or more reusable bags, and I keep them in every vehicle we own. Sometimes I forget, but I'm getting much better at remembering. It just takes making a conscious effort. Imagine if every person brought their bags with them to the grocery store how many plastic bags would not be used....which means they wouldn't have to be ordered, which means they wouldn't have to be shipped, which means they wouldn't be using fuel to get from where ever they originate to your local store......there is a domino effect here. Like ripples in a pond, little things can have a large impact. 10. Going paperless. I know we have to have bills, but going paperless is a step in the greener direction. We could probably save a forest if we all stopped getting bank statements and invoices each month. Instead of collecting business cards from people, I have started photographing the cards with my phone and giving them back. This saves the individual money on business cards (which I always end up losing or throwing away anyway), and it's one less paper item being used. Plus it's much easier to stay organized when all the business cards are in an "album" on my cell phone. 11. Eat local. We look for local meats and produce when we shop. If we don't grow it or raise it ourselves, then we try to support those close to us who do. By doing this we are not contributing to fuel cost of shipping things from far away, plus we support our local economy. It's surprising how many things you can find that are produced locally like honey, eggs, cheese, meat, bath products, baked goods, etc. Of course, your farmers' markets are an excellent source for local foods! 12. Preserve food. I just finished canning 10 quarts of tomatoes and 8 jars of peach jam. Tomorrow night I will can 20 more quarts of tomatoes and a dozen or so jars of dill pickles. Before the season is over we'll be freezing corn, beans, peas, peppers, carrots, zucchini, and whatever else we can get our hands on. This saves us a ton of money on the grocery bill, but it also means we are not buying imported, packaged foods that come from sources that most likely do not abide by green growing practices. Okay, so most of that was pretty obvious - but consistency is the key. I've done most of those things to some degree for years, but only lately can I say that I'm really focused on living a greener life. I know we have a long way to go on this journey of greener living, but every step we take - no matter how small - gets us a little closer to our goal.